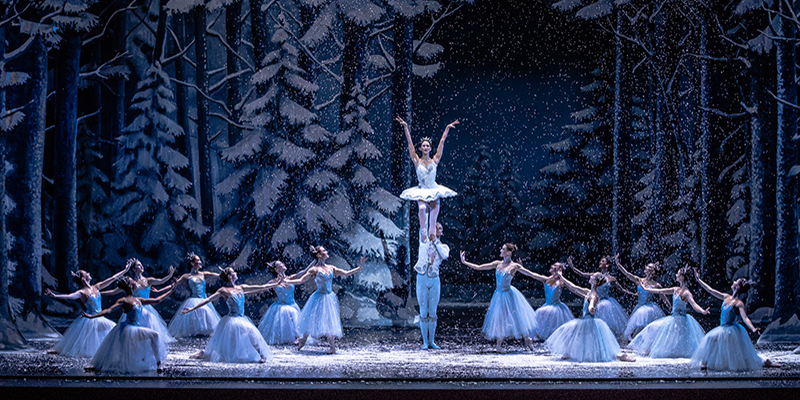 Kansas City is known for its huge offering of holiday and wintertime shows that make for the perfect way to spend an evening out to celebrate the season. Make a list (and check it twice). Here are the hottest tickets of the season. Perfect for all ages, this beloved Christmas tale receives a charming, lyrical rendition for the stage at The Coterie Theatre. Ebenezer Scrooge discovers the reason for the season in this joyful presentation of Dickens's Christmas classic, returning to the Kansas City Repertory Theatre's wonderful Spencer Theatre. From sacred to secular, the entire family will love the music in this spirited holiday show at Quality Hill Playhouse. This seasonal favorite put on by Mesner Puppet Theater showcases larger-than-life puppets that bring the biblical story to life at Grace & Holy Trinity Cathedral..
Head to the marvelous Kauffman Center for the Performing Arts for a captivating Kansas City Ballet performance of this enchanting tale. Join the Kansas City Jazz Orchestra as it swings through the season, featuring modern interpretations of timeless yuletide jingles. MTH Theater at Crown Center’s musical medley of a Christmas show features holiday tunes in a rousing performance you'll remember the rest of the season. This classical masterpiece is a triumph of the season thanks to nearly 200 Kansas City Symphony musicians and vocalists all performing in perfect harmony at the Kauffman Center. Kansas City Symphony's festive, all-ages concert experience features timeless carols, ringing bells, exceptional musical ensembles and even Saint Nick.